Also, marijuana tourism could become a growth industry. A Florida developer has applied to build a six-story hotel on Fore Street, the latest in a series of planned hotels to feed Portland’s hot tourism market. Developers plan to build the hotel at 203 Fore St. on an existing parking lot bordered by Fore, India and Middle streets, next to the downtown Hampton Inn. The proposed 128-room hotel will also have a parking garage and outdoor parking for 120 vehicles, a common area, restaurant and retail space on the ground level, and a rooftop bar on the fifth floor. The anticipated cost of the project was not disclosed in the application filed with the city on Oct. 11. According to developers, the project meets requirements in the development zone. The Fore Street project and two other hotels proposed this year could add more than 400 rooms to downtown Portland. Read the story here. Heather Ashby, founder of CoworkHERS, is converting part of the building at 411 and 415 Congress St. into a work space and social club for women that will feature offices, lounge areas, meeting rooms, a library, lockers and a fitness room. Portland entrepreneur Heather Ashby plans to open a shared workspace and social club for women called CoworkHERS on Congress Street in downtown Portland. Her intent is to create a work environment for women that is free from male harassment, judgment and intimidation in the former Mason’s building at 411 and 415 Congress St. Plans for the space call for offices, lounge areas, meeting rooms, a library, lockers and a fitness room. There will also be a room where children can play while their mothers work nearby, she said. Ashby hopes to host a grand opening of the facility on Dec. 1. Read the story here. Two Portland area businesses have joined the growing ranks of companies owned by their employees. Solar energy contractor ReVision Energy has converted to 100 percent employee ownership, as has Pro Search, a 23-year-old staffing agency. Employee Stock Ownership Plan, or ESOP, is a mechanism that allows employees to become owners of stock in the company they work for. Since 2003, ReVision has grown from two founders to 200 employees today who work from five locations in Maine, Massachusetts and New Hampshire. Eleven employees work at Pro Search, which also hires more than 200 temporary and contract employees working for employers across Maine. Read the story here. Cross Insurance, a subsidiary of Bangor-based Cross Financial Corp. and one of the largest independent insurance providers in New England, has acquired the Portland-based Holden Agency and its benefits division, Employee Benefits Solutions Inc., for an undisclosed sum. Eric Jermyn, president of Cross Employee Benefits, and Dave Messersmith, president of Cross Insurance in Portland, will assume branch management responsibilities, according to a news release issued Wednesday. Holden Agency executives Thomas Holden and John Benoit will remain on staff and assist with management of the office, it said. Financial terms of the acquisition were not disclosed, and the companies did not respond to questions about the size of the combined company. Read the story here. The Maine Small Business Development Centers, a statewide program that helps entrepreneurs start and grow their businesses, has received a $100,000 grant from the U.S. Small Business Administration to help former millworkers thrive as entrepreneurs. The SBDC said Wednesday that it will use the funds to develop a program that will provide entrepreneurial advising and training for potential and existing business owners in the Madison and Jay areas who have been adversely affected by the layoffs and closures of the Androscoggin Mill and Madison Paper Industries. The program will be designed to equip entrepreneurs and anyone interested in starting a business with a broad range of knowledge necessary to successfully develop and grow a small business. Read the story here. The Maine Center for Entrepreneurial Development received a $50,000 cash award to help develop its resources and training for entrepreneurs. The award was made Tuesday by the U.S. Small Business Administration as part of its Growth Accelerator Fund competition. The accelerators represent a broad set of industries and sectors from manufacturing to tech startups to farming with a diversified range of demographic groups, according to a release from the SBA. The award is expected to help the MCED expand intensive entrepreneurship training programs and mentoring into underserved rural communities. Read the story here. Mercy Hospital in Portland has agreed to pay $1,514,000 to settle allegations that it violated federal and state false claims laws by overbilling Medicare and Medicaid for urinalysis drug-screening tests. Those tests were ordered and performed at the former Mercy Recovery Center in Westbrook from 2011 to 2013, according to documents filed in federal court. Mercy Hospital, located at 144 State St., was acquired in October 2013 by Eastern Maine Healthcare Systems. The settlement agreement, which was announced Wednesday in a statement issued by U.S. Attorney Halsey B. Frank, avoids what court documents predicted could have been “protracted litigation.” Court records also point out that once the false billing was detected, Mercy Hospital cooperated with the investigation. Read the story here. Idexx Laboratories Inc. of Westbrook released its third-quarter earnings statement Tuesday, reporting a 10 percent increase in revenue and a 25 percent increase in net income. The company, which produces veterinary diagnostic testing equipment, software and other products, said its revenue for the quarter was $492 million, a 9.7 percent increase from $448.3 million in the third quarter of 2016. Idexx reported third-quarter net income of $70.5 million, or 79 cents per diluted share, up 24.8 percent from $56.5 million, or 62 cents per diluted share, a year earlier. According to the investor website Seeking Alpha, Idexx beat analysts’ expectations for net income by 2 cents per share but fell short of their revenue expectations by about $1.1 million. Read the story here. Corporate payment services provider Wex Inc. of South Portland said in-house growth throughout all of its business units led to double-digit increases in both revenue and net income in the third quarter compared with a year earlier. The company reported Wednesday that its revenue for the third quarter was $324 million, up 12.6 percent from revenue of $287.8 million in the third quarter of 2016. Wex reported quarterly adjusted net income of $61.5 million, or $1.43 per share, up 14.4 percent from $1.25 per share a year earlier. When not adjusted for one-time credits and charges, the company’s net income for the third quarter was $34 million, or 79 cents per share, up 72 percent from $19.7 million, or 46 cents per share, in the third quarter of 2016. According to investor website Seeking Alpha, Wex’s adjusted net income of $1.43 per share beat analysts’ expectations by 2 cents per share. Read the story here. Could Maine’s famous tourism attractions include cannabis social clubs in hotels, or “bud-and-breakfast” inns complete with in-room vaporizers and cannabis gift bags? What about farm-to-table dinners with marijuana-infused ingredients? Possibly, said attorneys who offered opinions about the potential business opportunities ahead for Maine’s hospitality industry. Maine legalized marijuana in a referendum question last November, but the state has yet to devise rules for the impending industry. 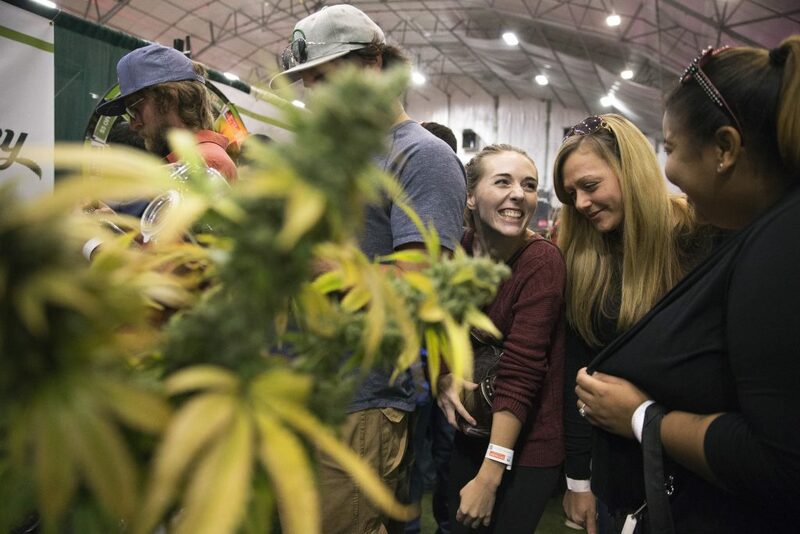 In other states with legal recreational marijuana, specialized cannabis tourism sectors have sprung up, providing marijuana-themed activities and accommodations for visitors. Read the story here.